Morning, and welcome to Lucky dip #6. 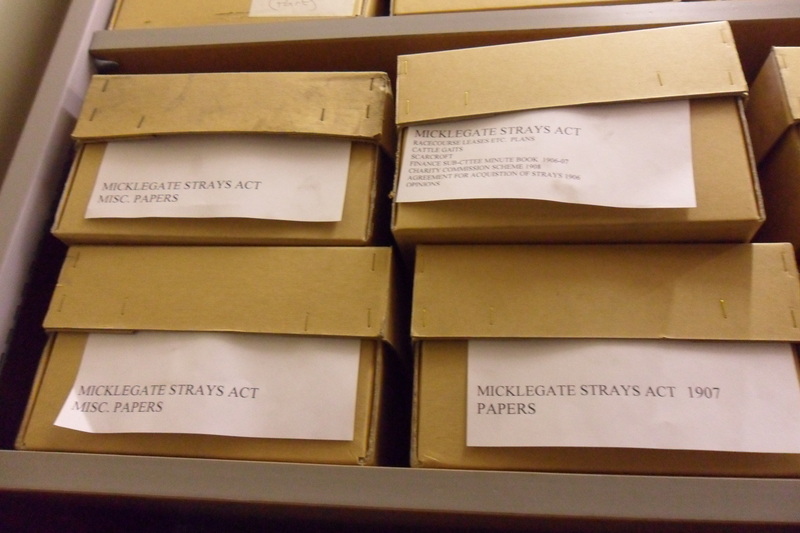 I recently researched the strays whilst working on my authority files so when I saw this cluster of boxes marked “Micklegate Strays” I picked one out in order to see what original records survive. I found that this box refers chiefly to exactly how the 1907 Act of Parliament came about. Micklegate Strays boxes – I picked the top left one out as “misc” always appeals! The strays were originally the ancient common lands. Following inclosure, the strays were vested in the corporation in 1763 in trust for the freemen. Each freeman had the right to graze so many animals, known as a gate or gait. This right could be rented out to other freemen (or later, non-freemen) if you didn’t want to use it yourself. Working notes on current price of gaits when this bill was going through. After municipal reform in 1835, rights to the strays were the only concrete benefit that the freemen had left. In the nineteenth century, tensions between the historic rights of a minority (York freemen) and the benefits of the wider community (York residents) grew. 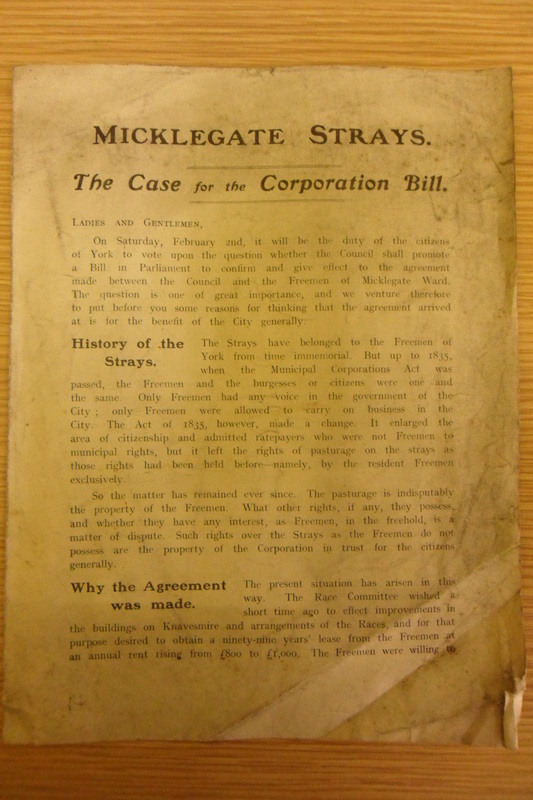 In 1907 the corporation sought to end the ambiguity by formally transferring the strays of the Micklegate freemen to the corporation by Act of Parliament in return for compensation. Opening the lid I find a scruffy pile of dirty papers, oh dear… As I went through them, however, patterns began to emerge and details fitted together to show fascinating insights into the mechanisms for how the strays were transferred from the freemen to the corporation and the controversy that caused. The papers that first caught my eye were the working documents of the people involved in the laborious process of getting a local Act through Parliament. Lots of the records in the box are drafts and notes, not created to be part of the permanent record, but which ended up in here anyway. Notes to the legal counsel assisting the bill. Another nice example of a behind-the-scenes process document is this envelope full of letters. They were written by a York MP of the time, written on House of Commons Library stationery, sending real-time information back to the council in York. 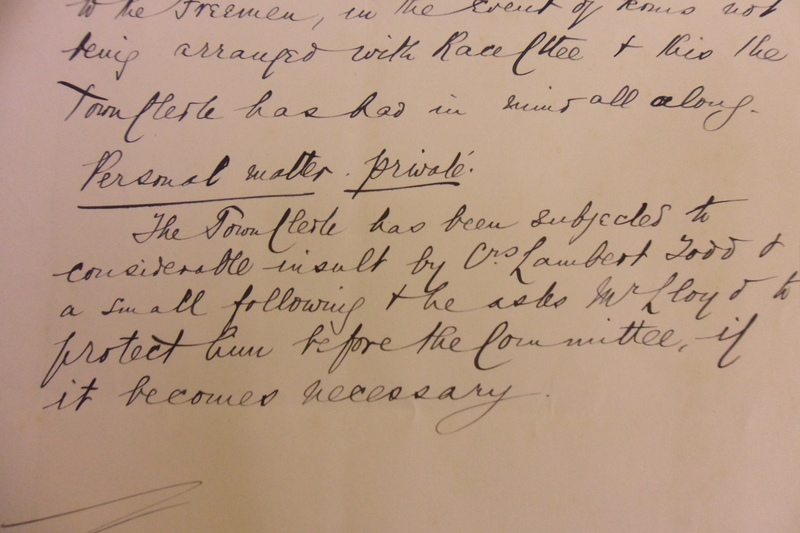 This letter says that the bill was read that day but the committee stage was unknown yet. I like this letter as it hints at the excitement and worry of trying to get a local Act through Parliament, and how different communications were in 1907. So that’s the process detail, what about the bigger picture, the context? The whole point of this Act was to take control of the strays of the Micklegate freemen, which included the Knavesmire (with its racecourse). 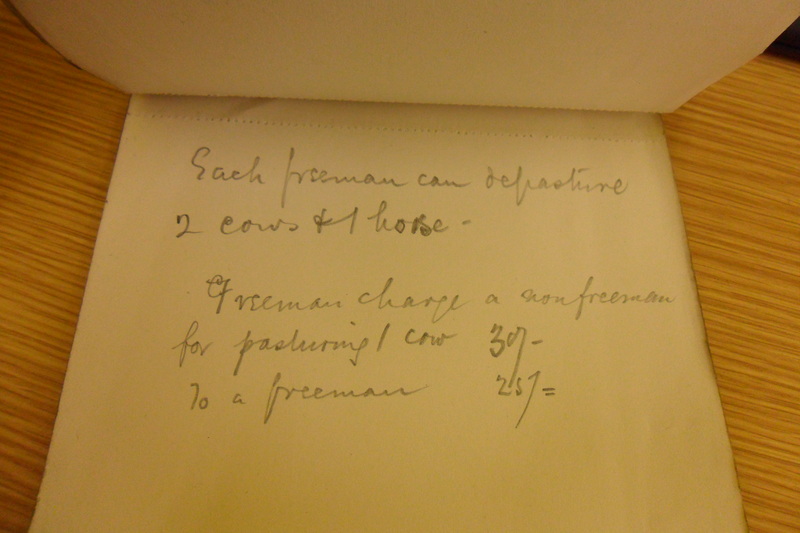 The corporation and freemen came to an arrangement of £1000 per year to be paid in compensation, to be divided amongst the freemen and freemen’s widows. 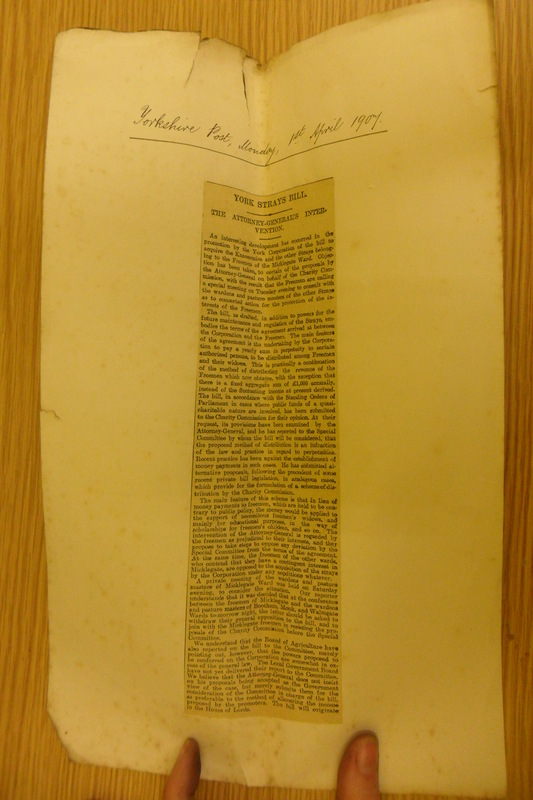 They signed an agreement on that basis following lobbying and publicity on both sides, including this printed letter by one group of freemen persuading others to support the plan. Printed publicity material explaining the bill. However, when the bill went to Parliament, the Charity Commissioners objected to straight cash being paid out indiscriminately. This threw a bit of a spanner in the works, and appeared in the regional papers in April. My fingers are not usually that grubby – this box of records was presumably kept in the Guildhall basement and are filthy. I had to wash my hands frequently to avoid spreading dirt from the outside of papers to the clean insides. In the end, it was agreed for the money to be distributed via educational grants and other specific funds for needy freemen, as opposed to all freemen. This was agreed, and the bill passed on those terms. I enjoyed reading through this box after so recently researching the strays using secondary material as I can see where historians have drawn their facts and opinions from. 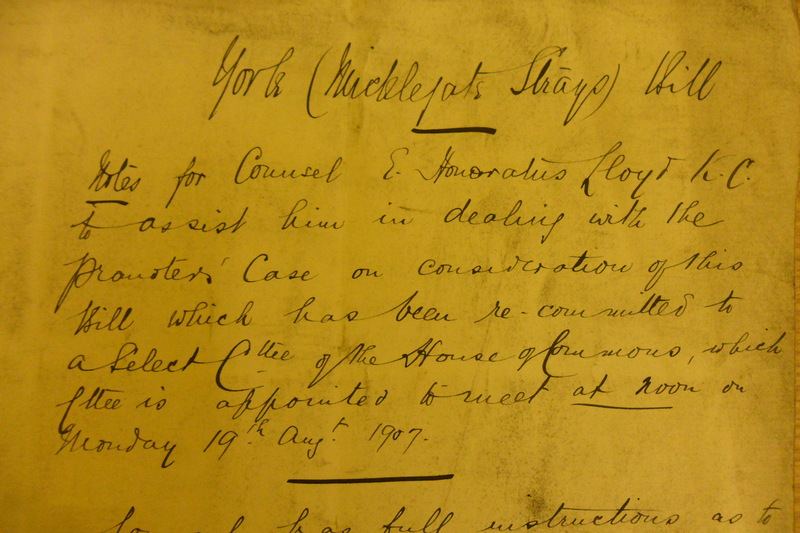 The mix of formal legal papers and ephemera and correspondence shows so many angles of what was a historically significant moment in the history of York freemen. It shows the actual negotiation and development of the relationship between the freemen, who historically had been the corporation, and the post-1835 corporation which represented residents. It shows how local democracy is not a clear cut path of progress, but an ebb and flow between different groups in a community. 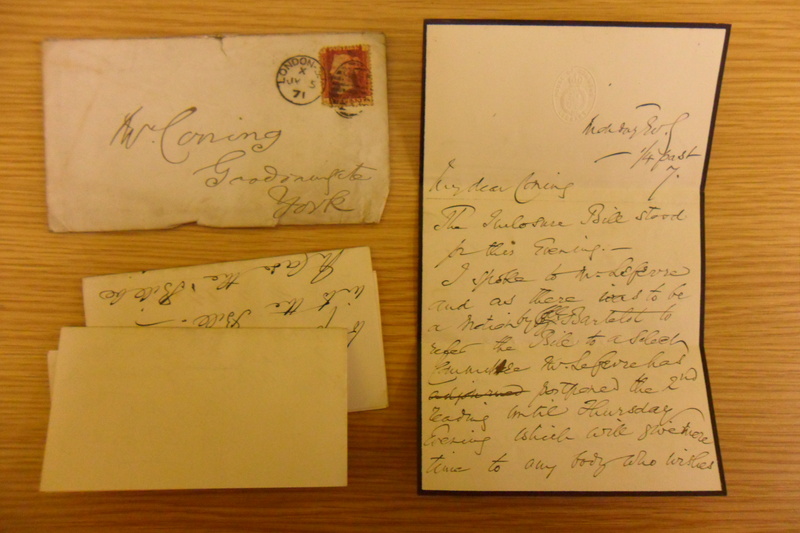 An archival postcript: You might have noticed that there are no catalogue references or accession numbers on the boxes. They are an artificial series put together sometime in the later twentieth century. This wasn’t done by the archive, but by the council, as a working legal compilation of reference documents about the strays. This highlights how the civic archive is a working business archive, containing many records: legal, architectural, environmental, that are vital to the running of the modern city. A record can be both a working document and a historical archive at the same time. In my new catalogue they will remain in this series, respecting this provenance, but they will be given the specific identity references they currently lack to control them. This entry was posted in Uncategorized and tagged Freemen, History of York, Knavesmire, Lucky dips, Strays. Bookmark the permalink. my grandfather the late Joseph Bagnall was a Freeman of the City of York. His sons predeceased him and I believe my aunt, Edith Bagnall(Dearnley) became a freeman but was told it could not be passed on further to her sons. I think my grandfathers brother was a Freeman too but not sure. Doris Bagnall was also a Freeman but not sure if it was passed on to her boys. Hi Audrey, I am a Past Master of the Gild of Freemen. From your mesage above it would appear that your Aunt was mis informed. From the above information her sons and indeed you and any off spring you may have are entitled to claim to become freemen. claims can be made by descendants of freemen of either gender as far back as Great great grandparent. More info can be found on the Gild website see below and/or from the City electoral roles department. thank you, just saw the reply above today! feb 12th here in the USA. will pass it on to the family here as a matter of interest and to my family in the uk. You are Very welcome Audrey, If I can be of any further help please let me know.